Info "When I wave, you pull! We gotta work together if we wanna win!" Anchor Man is one of Young Cricket’s Microgames in WarioWare: Smooth Moves. 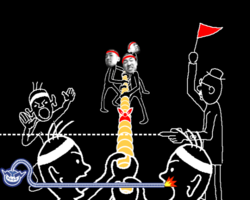 The player must win a match of tug-of-war. Their team will cry, "Pull! ", which is the best time to pull the Wii Remote back. 1st level difficulty: It takes only one tug. 2nd level difficulty: It takes two tugs. 3rd level difficulty: It takes three or more tugs. This page was last edited on February 19, 2018, at 18:58.